Wow, today marks 11 years since my mom passed away! I can’t believe how quickly time fly’s by. It seems like only yesterday, with her family gathered around her bedside, she came out of a coma to open her eyes, look at all of us and softly whisper, “I love you” before gently leaving this world forever. The fact that my mother came out of a coma to bid her family farewell may seem extraordinary to some, but for Trudy, it was par for the course. Nothing and I mean NOTHING, meant more to her than her family. She adored us all so very much (and we, her) that over a decade since her passing, we can all still feel her here with us; watching, guiding, and protecting, as only Trudy can. It is very comforting. There are some things about her that will forever be hers and hers alone; a yellow teasing comb with a pointed handle, the smell of “Intimate” or in later years, “White Diamonds” lingering on the wardrobe that hung in her closet, lavender flavored chewing gum at the bottom of her handbag, Kent 100’s (even decades after she gave up smoking), long beads tied in a knot between her bosom, and of course; the unique ability to randomly produce a bobby pin from her head, regardless of her hair style. My sister, Maureen and I were convinced that she would “squirrel” a few of the hair-pins away while washing her hair, just in case they were needed down the line! Could it be that she was a secret agent and never knew when she would have to pick a lock? When she was bored she would simply call out, “sing that Humperdinck song for me, Don?” I would always pretend to be “put-out” but after rolling my eyes in mock protest, I would burst into “Quando, quando, quando,”, actually quite pleased with the notion that my little serenade could make my mom so happy. She would randomly turn on the radio and request my sisters to “dance for mommy,” and of course, they always complied. There was something so wonderful about making my mom smile that made you feel honored to have the ability. From a foodie’s perspective, to this very day, there will never be another tomato sauce like hers or meatloaf, pot roast, or London broil for that matter. Mom had a wonderful ability to tell a story that kept you on the edge of your seat or laughing so hard you were splitting at the seams. She was the life of any party and to this day, I swear my friends enjoyed her company more than mine! For seventy-eight years, Trudy Wilson-Massetti-Abate was beautiful, funny, smart, classy, interesting, talented, kind and above all; loving. It was because of those qualities, we often forget that she was also extremely strong and brave; conquering illnesses and tragedy [that would cause most among us to simply give up] with an optimistic, tender grace, all her own. Even her flaws simply added to her charm. 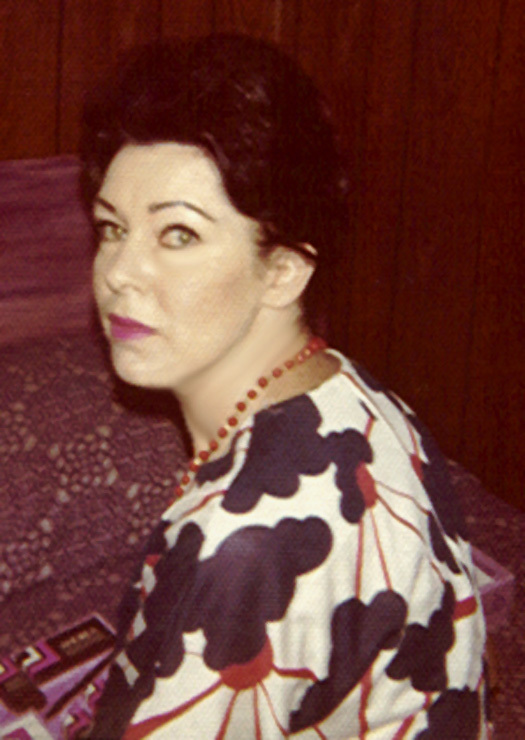 Like the great screen legends, TV stars and songstress’ of her day; my mother was a rare, one-of-a-kind woman. Maybe that was the way they made ‘em back then? Although there will never be another like her, my sisters, nieces, nephews, and I, can do our best to carry out her legacy and keep her memory alive. If she was a part of your life, you remember her fondly and I promise you, you’re happy for it. If you never had the chance to get to know my mom, I must admit, it makes me feel kind of sad for you. Maybe one day soon I will have my book finished and through reading “Unforgettable” you too will know her and hopefully be touched by her inimitable spirit and like all of us, find her to be truly… unforgettable too! A friend of mine had a slogan posted on her Facebook page the other day. It read, “Love is such a big word it really should have more letters.” It’s a cute little slogan because it’s true; love is a really big deal and we all want to be loved! Sometimes I think we, as a people, have actually forgotten the true meaning of the word. After all, just look at the way we throw it around. Do we “really love” that Rianna song? How about that chocolate bar or that pair of shoes (with red bottoms or not!) or for that matter; the latest Mercedes-Benz S-600, or new diamond necklace? At best, these are things we should merely enjoy or even like… but love? Seriously? I believe that we should not take the word “love” so lightly. Shouldn’t it be reserved for people and God?!! And perhaps our pets; who give it back to us so unconditionally. Speaking of God, even he only mentions the word love once in the Ten Commandments. In the second commandment, when he speaks of having no false gods before him he states; “for I am the Lord thy God, a jealous God, recompensing the sins of the fathers upon the children, to the third and fourth generation to them that hate me, and bestowing mercy on them that love me to thousands of them, and on them that keep my commandments.” I really can’t say that I blame him. How ungrateful can we humans be to not love the very God that created us and everything we see? Clearly, even God just wants to be loved. What makes love so very important and how do we know what to and what not to love? I look at it this way; what you LOVE is what you would risk your life to save should you fall victim to a house fire. You would beyond a doubt be willing to go down trying to save your children; again so with your spouse, or any family member for that matter! Would you however run into a burning building… to save your Louboutin’s? I don’t think so; but you probably would to save your dog, cat, or even your bird or turtle. The reason you would do this is because they are living things and as such, we do love them. Maybe what we love is “life” and we respect the beauty of it. It’s no secret that I am a Christian; in my faith we follow the teachings of Jesus Christ, whom we believe to be the only begotten son of God. Whether you believe that or not; you do have to admit that the man truly was an exceptional example of love and kindness, who suffered horrifically at the passion and crucifixion. All this because he preached that we should not let the duties of the church and it’s traditions cloud the big picture so much that we forget to love and be kind to one another. So maybe you agree that we don’t “really love” our “things” but we do love each other. That said, what about the old bearded man who you see every morning pushing a shopping cart full of [what you think is] junk along the side of the road? How about the small Guatemalan woman with three young children at her side, standing in the rain waiting for a bus to go to the health center? Then there is the [seemingly] crazy woman who hangs out in the park, looking up at the sky; what of these people? Do you love them too? My guess is that you do; you may fear them a bit. After all, we’re all afraid to admit that it’s only by the grace of God that we are not in their situation and that instills fear… but I do however believe in my heart, that all of you reading my words right now, really do love those unfortunate people. Furthermore, I believe that if it were at all possible you would help to change their situation and make their life a better one. Well guess what? You can! A simple smile goes a long way and helps to make people feel that they matter. Life isn’t always pretty but we can’t turn away from it making those who are suffering feel so insignificant that they might as well be invisible. Everyone we touch; each and every day of our life, brings a new opportunity for us to either learn a lesson or maybe even teach a lesson. The wonderful thing about it is that you never know which one it will be until it happens! Cool heh? In a world full of turmoil, where brother is pitted against brother over silly things like religious differences, land, water, and oil (to name only a few) my prayer is that we all open our eyes and realize that we cannot “own” any part of the planet and that we are all one family under one God. Some of us may be more fortunate than others as to the geographic location we were born into but IT IS NOT OURS TO OWN. We are merely caretakers and as such, we have a responsibility to see that the plentiful resources of this majestic planet are spread to all those in need. It is our duty to see that all of our brothers and sisters, worldwide, no matter of color, race, or religion, share in the bounty. In this day and age, there is no logical reason anyone should go hungry or thirsty or be without the medical care they require. The means to get what is needed, where it is needed is at our fingertips. Can you imagine if all of the money and time wasted on war and hate were put to use helping the needy? We would not only have a world without war; we’d have a world without children dying of hunger, thirst and after enough research, very little (if any) disease! But getting hearts full of hate to turn into love is no easy task. Perhaps we have to change the world a tiny piece at a time, helping (or least understanding) one shopping cart man, alien mother and sky-staring lady at a time. What the world needs now is love, sweet love… it is STILL the only thing that there’s just too little of. Thank you all for stopping by. I bid you love.